Visual communication has been important part of sharing our ideas. From simple cave drawings, hieroglyphs to modern letters, charts and more. Yet again past decades people are more and more using only textual content to collaborate and share our ideas and knowledge. At work, it is all the hundreds emails you receive, miles long chat conversations, thousands documents stored on your drive and more. It’s difficult to navigate and consume. Here’s why with simple visual communication you can make a difference. 1. We think in pictures. Not words. 90% of information transmitted to your brain is visual and your brain is able to process visual 60000 times faster than text. Walking across the street and seeing a car approaching – your brain tells in a second that it’s dangerous. Imagine reading the scenario from piece of paper, how quickly will you process this information and get out of the way? Same is oftentimes at work. Do you prefer having your design feedback conversation for example happening on countless chats or email threads, or perhaps a simple real-time visual conversation? 2. We remember most of what we see and interact with. It is proven that humans remember only 10% of things we hear and about 20% of what we read. Based on this, you will remember only 20% of all the text written here. It is also proven that we remember about 80% of what we see and interact with. This is why we remember much more of the conversations in front of whiteboards – we draw and visualise our ideas and we interact with the content. 3. When working with text and visuals, we use both sides of our brain aka we understand things. Left side of our brain is responsible for analytical thinking, logic, reasoning, written content, science and math and more. Right side then again is responsible for creativity, imagination, holistic thought, insight and intuition. When we read white papers or researches, we use only left side of our brain as we really focus on analytics, reasoning and written text. Try creating visual sketch-notes from what you read, and your brain is able to help you not only get further insights and understanding, but you will also remember the materials better. 4. Visual language is the most common language in the world. Each country and language has it’s own context, culture and background. If you are an executive who wants to contemplate a business challenge from various perspectives, a software developer, or a person doing strategy, nothing can be more important than a right tool to hone your ideas and give them a finished touch. Visualizing ideas helps to drive the point home not only with yourself, but with the others, if you want to make sure that they understand what you mean. Visual conversations are not about making art. It’s about explaining your ideas using visuals and drawings. If a simple box and arrows can explain better what you need to say, that’s what you need. 5. It makes work not feel like work. We always seek to find the fun side of things. A simple joke, fun collaboration, or simply doing something amazing with people around the world. 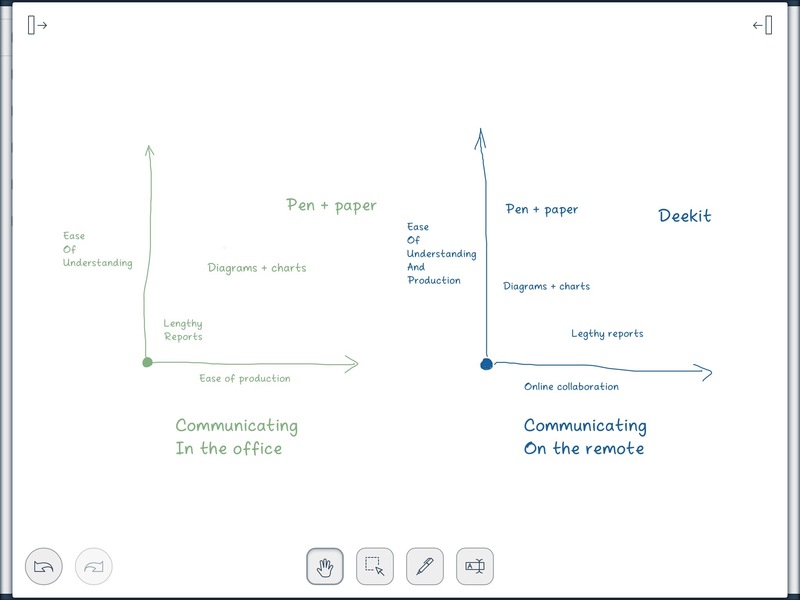 Real-time visual conversations enable bringing together both sides. Think about retrospective meetings – they can be a dull boring conversation that quickly end up with half an hour complaining session about all the things that went wrong. At Deekit, we draw a lot and we draw with our entire team.